Rewind: Artists’ video in the 70s and 80s derives from a four-year research project into the history of an art form that has become the hallmark of contemporary art. Based on an archive of interviews, ephemera and archive copies of tapes and installations from the pioneering period of British video art, this anthology brings together some of the leading scholars in the field, backed by an expert panel, to lay the groundwork for a history of the people, activities, institutions and interventions that made of video art the one true avant-garde in the United Kingdom in the 20th century. 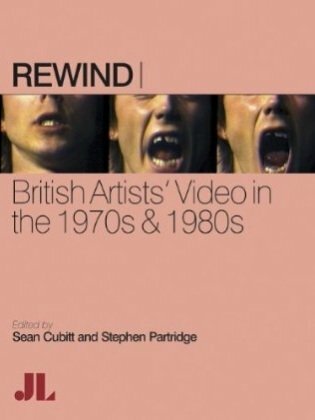 Rewind is the founding text for the history of British video art; draws on a unique archive of oral history and personal experience; and opens up the archive for contemporary artists, curators, media historians and archivists. The primary audience for the book lies in art history. Secondary areas include the growing field of media art history, archiving and conservation, media history and film and media studies. It will have a market among the increasing number of gallery visitors, many of them practicing artists, who have been introduced to the field of early video art by the Rewind project and connected projects, including the Future Histories of the Moving Image Network. There is international interest through the global Media Art History and Leonardo/ISAST groups and the many parallel research projects underway in fifteen or more countries worldwide. Sean Cubitt is Director of the Program in Media and Communications at the University of Melbourne and Honorary Professor of the University of Dundee. His publications include Timeshift: On Video Culture, Videography: Video Media as Art and Culture, Digital Aesthetics, Simulation and Social Theory, The Cinema Effect and EcoMedia. His current research is on public screens and the transformation of public space, and on genealogies of digital light. Stephen Partridge is an artist and academic researcher. He was the principal investigator on the four-year AHRC funded research project REWIND|Artists’ Video in the 70s & 80s. He was in the “landmark” video shows of the 1970s including the Video Show at the Serpentine in 1975, the Installation Show at the Tate gallery in 1976, The Paris Biennalle in 1977 and The Kitchen in New York in 1979. During the eighties he exhibited widely and also became interested in works for broadcast television and was commissioned by Channel 4 television to produce Dialogue for Two Players in 1984. With Jane Rigby, he formed Fields and Frames Ltd – an arts projects and television production company – which produced the innovative Television Interventions project for Channel 4 in 1990. He also co-produced a short series of student and artists work, Not Necessarily, with BBC Scotland for BBC2 network television in 1991. He has lectured since 1975 in a number of art colleges, and established the School of Television & Imaging at Duncan of Jordanstone College of Art & Design (University of Dundee). He is presently Professor of Media Art and Dean of Research.